Basil Hancock has studied Park Royal's records and found planned variations on the Routemaster theme which never reached production. The London Transport-AEC-Park Royal Routemaster is probably the best known, and certainly one of the best loved, bus designs in the world, and has now become a tourist attraction in its own right. The RM was originally designed and developed as a replacement for London's large fleet of trolleybuses, but later also superseded the huge RT, RTL and RTW fleets too. While the basic Routemaster and its derivatives were essentially London Transport vehicles, with only Northern General purchasing any outside the London area, it is ironic that in its later years many operators throughout Britain and abroad, including many of those who refused to buy it when it was being built, have come to appreciate its many virtues, and the RM is now to be found in many places and wearing many liveries undreamt of even five years ago (mid 80's relative to date of publication). It is said that the original Routemaster design included provision for a trolleybus version, but to date no drawings of such a vehicle have come to light. However, a look through the records of Park Royal Vehicles has revealed an interesting set of variations on the Routemaster theme, none of which was ever built. To what extent these were developed, as a result of serious enquiries, or were possibly only some tentative proposals for the future, is not known, but all of the designs described and illustrated in this article most certainly existed on paper. The fact that they were all given official Park Royal drawing numbers, and quite obviously took up a considerable part of the draughtsmen's valuable time, must mean that they had at least some official blessing. Three basic types of Routemaster variant were drawn up comprising derivatives of the standard vehicle for other operators, rear-engined double-deckers (FRMs) and rear-engined single-deck buses for London Transport. Instead of reproducing proper layout drawings of these vehicles, I have tried to show how they would have looked had they actually been built. In nearly all cases this has meant that views of the nearside have resulted because most of the original drawings did not show the offside and I have resisted the temptation to guess at details where they are not shown. Similarly, most drawings did not give an indication of the proposed operator, so only where this is known have I shown a livery of the appropriate period. In addition, the records of Park Royal Vehicles show a very few additional Routemasters which were actually ordered but were never built, and these are detailed in the text. Looking firstly at the derivatives of the standard RM, it would appear that during the latter half of 1962, following the use of Routemasters as demonstrators by various operators, feedback indicated the need for some changes to the basic vehicle. Three new versions were proposed, namely Drawing Nos 9344 which showed a 30ft long forward entrance 71-seater (H40/31F), 9378 which showed a 31ft 10in long 82-seater (H47/35F) also with forward entrance, and Drawing No 9382 which showed a 27ft 6in 64 seat (H36/28R) rear entrance bus. The last was virtually identical to the standard LT bus and the first was broadly similar to the batch built for Northern General and of course LT's own RMF 1254. The 82-seater had the same basic layout as the RMF but with elongated rearmost bay, giving a rear overhang of 9ft 6in which was exceptionally long for the time. 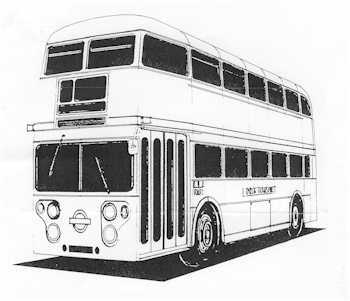 All three designs were unmistakably Routemasters, but had features such as sliding instead of wind-down windows for ventilation, fixed front upper deck windows, and additional ventilators in the front roof dome, though no doubt any of these features could have been altered to suit individual operators' requirements. No details of the interiors were shown apart from seating layouts, but it is probable that the interior trim would have been different in order to reduce costs. Mechanically all the variants were based on the RM6 model. The FRM is one of the great might-have-beens of the postwar UK bus story, and Park Royal obviously had a good look at the idea. Drawing No 9472 was dated July 1964 and must have been made at about the same time as the first proper proposals were being put together at Chiswick. It showed a rear-engined double-decker which bore an obvious resemblance to what eventually became FRM 1, but with a shorter rear overhang and a more conventional treatment of the engine bustle. 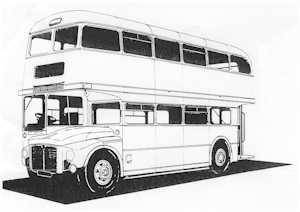 In fact, as drawn it had an Atlantean engine cover, probably because the draughtsman knew of little else! 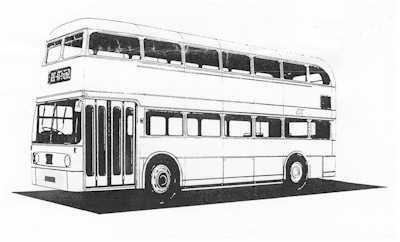 The layout showed a 72-seater (H39/33F), and the scheme differed from the FRM in the use of conventional ventilator, with opening windows, and a front end using flat windscreens and different lower panels, apparently owing a lot to the Atlantean and Fleetline body design then being built by Park Royal for Sheffield, amongst others. By the time that Drawing No 9520 was made in September 1965, the layout of the FRM was obviously more advanced, and this drawing showed the details of the 'Provincial FRM Standard', to quote from its official title, The bus looked much more like the FRM, even down to its seating layout (H41/31F) and the use of fixed windows and a forced-air ventilation system. The major areas of difference were in the use of only a single front destination/route number box and, most notably, in the use of double curvature BET windscreens together with a redesigned curved lower front, which added 8in to the overall length. The interior layout was notable for its apparent use of filament rather than fluorescent lighting. By this time, enthusiasm for the Routemaster must have been running high at Park Royal Vehicles, for the company then went on to produce two layouts for 36ft-long rear-engined single-deck Routemasters. 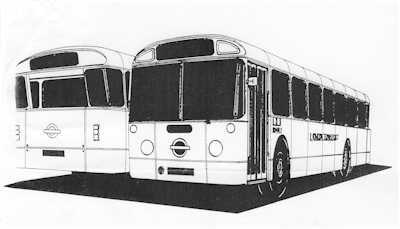 The first Drawing No 9498 of March 1965, showed a single door vehicle with a body style broadly similar to contemporary BET single-deckers, though with rather flatter windscreens. Some 45 seats were to be fitted, and the relatively low floor height allowed the overall height to be as low as 9ft 2in. The most notable feature of the body’s appearance was the use of curved rear corner windows, raked back in Ford Anglia style, with a recessed centre portion to allow for the engine cover to be opened, which led to a very short rear engine bustle. Mechanically the bus was described as being mounted on a .rear engine chassis - LTB type - RMR running units. Was it possible that the FRM too was originally to have been the RMR? Five months later, a modified version, Drawing No 9516 appeared, and this time the vehicle was a two-door (front entrance, centre exit.) 43-seater mounted on FRM running units. The front overhang had been extended by 6in. and the wheelbase shortened by a similar amount, while the rear end styling had been tidied up to a modified BET style, although still retaining the recess for opening the engine cover. The use of a rear overhang of no less than 10ft 6in in combination with a wheelbase of only 18ft, together with a transverse power pack mounted at the extreme rear and a very low height body can be expected to have led to some body problems later in life, not to mention making for a choppy ride, while the very low height at which the engine was mounted could have caused frequent problems with the rear end grounding. Certainly it has to be said that not a lot of detailed thinking appears to have gone into these two proposals, and it was probably as well from the point of view of the Routemaster's reputation that these two single-deck variants were never built. So much for the designs that were drawn up, but what about the Routemasters that were never built? Park Royal Vehicles used to issue a periodic internal document detailing vehicles on order and ‘on hand’ (ie in course of construction), and in December 1962 a new vehicle appeared on this list. Body No B49807 was described as a '78-seater forward entrance double-deck omnibus incorporating AEC running units, 31ft 8in. by 8ft'. While not actually described as a Routemaster, the use of AEC running units rather than a chassis implies that it was a Routemaster since the only other likely contender, the Bridgemaster, was by then out of production. However the length was greater than normal for the time but the details as shown match almost exactly the extended overhang RMF detailed on Drawing No 9378, except for having 78 seats rather than 82. But, for whatever reason, B49807 did not materialise and despite being shown as on hand until 28 December 1963, had disappeared by 28 April 1964, when the next 'on hand’ list appeared. Coincidentally, also in April 1964 there appeared the first mention of body Nos B53296-53298 'Front entrance RM double deck demonstrator' and here we have possibly the first evidence not only of the FRM but also of the fact that there were actually three such vehicles ordered. All three vehicles then appeared regularly in the lists until 31 December 1965 when the order was reduced to B53296 only with B53297 and B5329E cancelled. B53296 then continued to appear in the ‘on hand’ listings until 2 April 1966, but had disappeared by July 1966, at about the same time as the first sightings of FRM 1 were made at Chiswick. B53296 was FRM 1, but what happened to the other two FRMs and how much, if any, of them was actually built remains to be seen. However there were very strong rumours at the time that a demonstrator was to have appeared, probably at the 1966 Commercial Motor Show, in Sheffield livery (probably for the A, or Corporation-owned, fleet) and it is likely that Drawing No 9520 described above shows such a vehicle, which was presumably to have been either B53297 or B53298. Surprisingly, the FRM story does not end there as in March 1965 B54147 was ordered as one set of pattern parts of front entrance RM double-deck vehicles B53296-53298, and this was listed as 'on hand’ from then until 31 December 1966, but had gone by 1 April 1967. No other information is given, but it seems most curious that another set of FRM parts was apparently constructed after the cancellation of the other two vehicles. Was this perhaps just a set of spare components for FRM 1, or does the phrase 'pattern parts' imply that they were made to enable the setting up of a production line? Unfortunately the Park Royal records are silent on that one. Perhaps the most odd thing about the five vehicles mentioned above is that not only were they all actually ordered, but that, those that never materialised survived in the 'on hand' listings for as long as they did (a minimum of 12 months for B49807, 19 months for B53297/8 and 21 months for B54147). The questions must be asked as to why they were apparently being built as firm orders for so long, how much manufacture, if any, was carried out on them, why they never appeared and what became of them. The answers have yet to be found. This article only concentrates on the Park Royal drawings and orders, but it is interesting to speculate on what other Routemaster designs might have been drawn up by AEC and by London Transport itself. And, of course, there were two other Routemaster derivatives. The Leyland B15, later known as the Titan, originally started out as a double-deck bus based on FRM-type units, to use its official original description, though it certainly deviated from that initial intention, and London Transport itself spent many years working on all sorts of advanced double-deckers under the overall project name of the XRM. However neither the Titan nor the XRM can really be said to have been close Routemaster derivatives even if the RM provided the original inspiration.